WMATA might finally be able to build something on its extremely valuable land surrounding the Takoma Metro Station, after 14 years of effort. Starting in 2000, it worked with developer EYA and proposed building approximately 90 townhouses, each with a two car garage. Local residents objected to the proposal, and complained that the design had too many parking spaces, too many streets and eliminated too much green space. 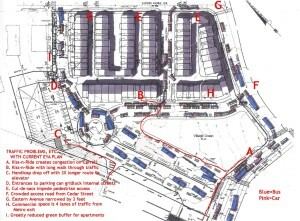 WMATA ditched the plan after several years and, in 2013, began work on another EYA proposal for a new building that took neighborhood concerns into account: a 250-unit, mid-rise apartment building with a much smaller footprint, and fewer than half of the residential parking spaces. EYA’s new proposal would allow roughly the same amount of people to move into the desirable neighborhood, while preserving the green space and addressing the other concerns. Sounds like a win-win, right? 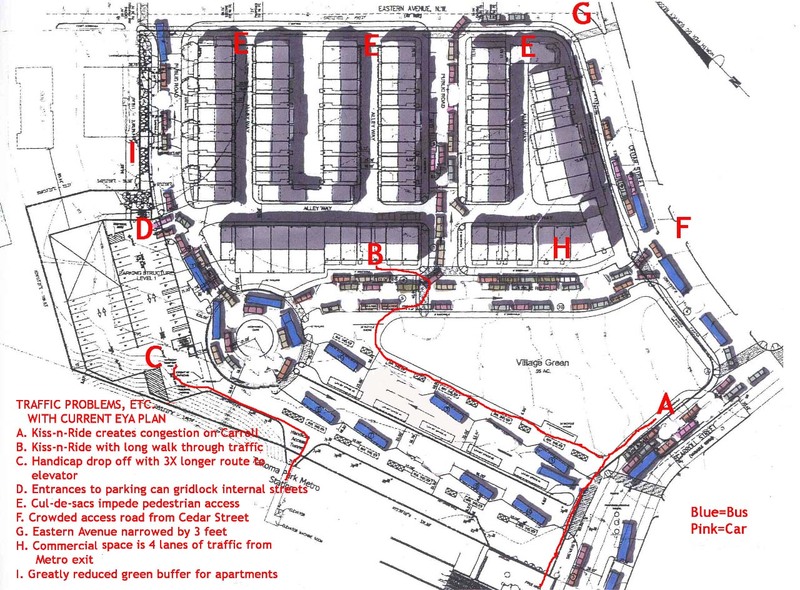 DC/MDNFT wants the site to be transit oriented, but also wants EYA to build 153 parking spots, in addition to the 178 resident spots. They also want to make sure commuters cannot use any of the 153 parking spots. They’re also concerned that all the additional parking spots will increase traffic. DC/MDNFT wants the building to make the neighborhood more walkable, but have large setbacks, be less than 50-feet tall, preserve green space and fit in with the character and scale of nearby buildings (except for the 150-unit apartment building a block away, the 10-story building immediately behind that, the four-story, 145-unit building on the other side of the tracks and the four-story townhouses next door, all of which presumably don’t count). So far, EYA has lowered the number of units proposed and reduced the size of the building. We live in a world of tradeoffs. Building 153 non-resident, non-commuter parking spots at the station is going to increase traffic and the size of the building, compared to what EYA otherwise would have built. Enormous setbacks mean a building has to be much higher to have the same number of units. Walkability goes down when buildings are set far away from each other or from the street. If groups like the DC/MD Neighbors for Takoma Transit want to influence the project positively, then they need to accept these tradeoffs and give up on demands that conflict with their other priorities. A process like the one above is at work every time a building is proposed. A system that allows neighbors to substantially alter a building just because they don’t like its design means that we will continue to have buildings that are too small to meet demand in the entire district, with a housing shortage to match. Trying to meet the demands of people who would prefer a surface parking lot to new neighbors is only going to increase the cost of homes. WMATA should insist that EYA build all 250 units for the sake of affordability and to address the on-going housing shortage. The non-resident parking should either be open to commuters to promote transit, or should be eliminated from the project altogether. An apartment building built on public land at a Metro station is a prime opportunity to create a better, more affordable district. 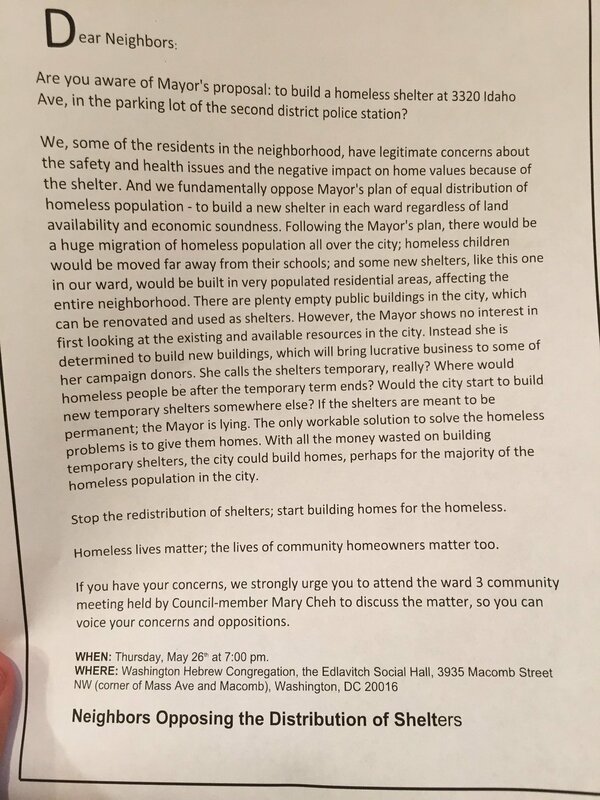 When the plan comes before the zoning commission, they should take these considerations into account, not the mutually exclusive demands of the neighbors.